CEPR’s latest paper, “Alternatives to Fiscal Austerity in Spain” by CEPR Co-Director Mark Weisbrot and Research Assistant Juan Montecino shows that Spain, under pressure to cut spending and raise taxes while its economy is barely recovering, might be better off with a continued stimulus. "The planned budget cuts and tax increases in Spain are not only unnecessary, but socially and economically destructive," said Weisbrot. "They also could easily leave Spain with a worse debt problem than they would have with a continued fiscal stimulus." Mark points out that there are no convincing economic arguments against further global stimulus in his recent Guardian column. CEPR Co-Director Dean Baker has also been busy countering the deficit hawks and fighting the anti-stimulus talking points. This recently released issue brief notes how the Congressional Budget Office has changed its modeling to worsen the potential impact of deficits and debt on private investment. Dean also uses his Guardian column to point out the absurdity of addressing the deficit when so many are unemployed. On Amy Goodman's Democracy Now, he talks about the deficit hawks and their desire to cut Social Security. In this video, he debated Douglas Holtz-Eakin on the expiration of the Bush tax cuts (he also discussed US tax policy on NPR’s On Point.). And on CNBC, he explains what the July jobs report means for economic recovery. Oliver Stone’s latest documentary, "South of the Border", co-written by Mark Weisbrot, is showing to large audiences in various US cities and recently opened in Dallas, Houston, Phoenix, and New Orleans. This coming weekend, the film opens in Seattle, Minneapolis, Santa Barbara and Portland, OR. Mark traveled to Chicago and the San Francisco bay area earlier this month to talk about the film. You can hear him talk about the film here, here, here and here. Mark continues to respond to ill-informed criticism of the film. The New York Times published a letter from Stone, Weisbrot and Co-Writer Tariq Ali that responds to the most erroneous of the reviews, from Larry Rohter of the Times. Mark discusses this and other media misperceptions here. You can even vote for your favorite review mistakes here. According to Dean Baker, there were a few positive aspects to the final bill, namely the creation of a strong independent Consumer Financial Protection Bureau. Baker cautions, however, that it will be important that President Obama choose a strong and effective person, such as Elizabeth Warren, as the first head of the Bureau (Dean makes the case for Warren in this op-ed). But overall, he laments that there is little in this legislation that will fundamentally change the way that Wall Street does business. “The rules on derivative trading will still allow the bulk of derivatives to be traded directly. The Volcker rule was substantially weakened by a provision that will still allow banks to risk substantial sums in proprietary trading. More importantly, there is probably no economist who believes that this bill will end the risks of too-big-to-fail financial institutions. The six largest banks will still enjoy the enormous implicit subsidy that results from the expectation that the federal government will bail them out in the event of a crisis” said Baker. Dean discussed the financial reform bill on Countdown with Keith Olbermann. And he outlines what he sees as the right prescription for the ailing economy in an article in the Nation magazine. The first, “The Adult Recession: Age-Adjusted Unemployment at Post-War Highs” by CEPR Economist David Rosnick, adjusts the current unemployment rate to account for demographic differences between now and the early 1980s and finds that, on this adjusted basis, the unemployment rate has not fallen below 10.8 percent in the last 12 months. During the worst episode of the recession of the 1980s -- the second half of 1982 and the first half of 1983 -- unemployment passed 10 percent for 7 months. CEPR also released “The Urgent Need for Job Creation, written by CEPR Senior Economist John Schmitt and CEPR Research Intern Tessa Conroy. The paper shows that if job creation in the current recovery matches rates in the 2000s expansion, the economy will not return to pre-recession unemployment rates for more than a decade. "The economy desperately needs action on job creation," says Schmitt. "At current and projected job creation rates, we will still be suffering from the effects of the downturn well into the next presidential term." On July 20th, Senator Al Franken, Representative Keith Ellison and Alan Charney of Jobs for America Now joined John Schmitt for a press conference to discuss the findings. John also did radio interviews the next day for WTOP and KPFK. 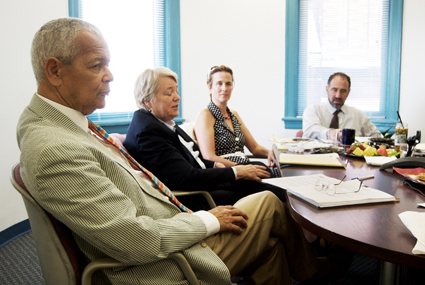 The July 2010 meeting of CEPR’s Board of Directors included two new members: Chuck Collins and Danny Glover. Chuck Collins is a senior scholar at the Institute for Policy Studies (IPS) and directs IPS's Program on Inequality and the Common Good. 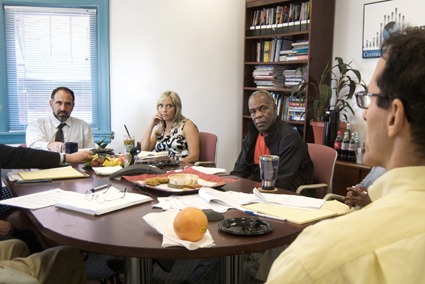 Danny Glover is an actor, producer and humanitarian, and is President of the Board of Directors of the TransAfrica Forum. CEPR is honored to have Danny and Chuck on board.